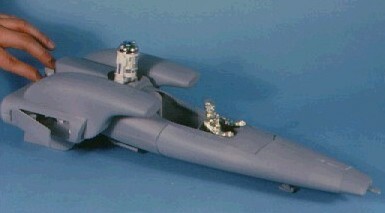 The White Witch would have been the third vehicle in the Droids action figure line, following the A-Wing Fighter, Side Gunner and ATL Interceptor. It has very much the appearance of a hot rod, with big engines, a long profile and lots of smooth curves. These photos show a hand-made model of the toy, composed of pieces of vacu-formed plastic. It's been painted with a coat of gray primer. This shot of the toy, which shows it up on risers, illustrates a mechanism on the bottom which allowed for a small gun to be lowered for action. Here you see the landing gear engaged. The principle action feature planned for the vehicle was a nifty break-away front. Apparently, the nose of the toy could split open, probably to reveal some sort of weapon underneath. Other features that the White Witch was planned to incorporate included an "engine" which gave off sparks and a turbine located towards the back which would spin when the toy's wheels were engaged. The White Witch is not known to have made it past the prototype stage; I do not believe production tooling was ever created for it. Photos of a hand painted version of this mock-up exist, as do images of a mock-up package.